Editors Note: This article has been revised and re-issued as the Editor had introduced issues into the article during the editing process. Our apologies. 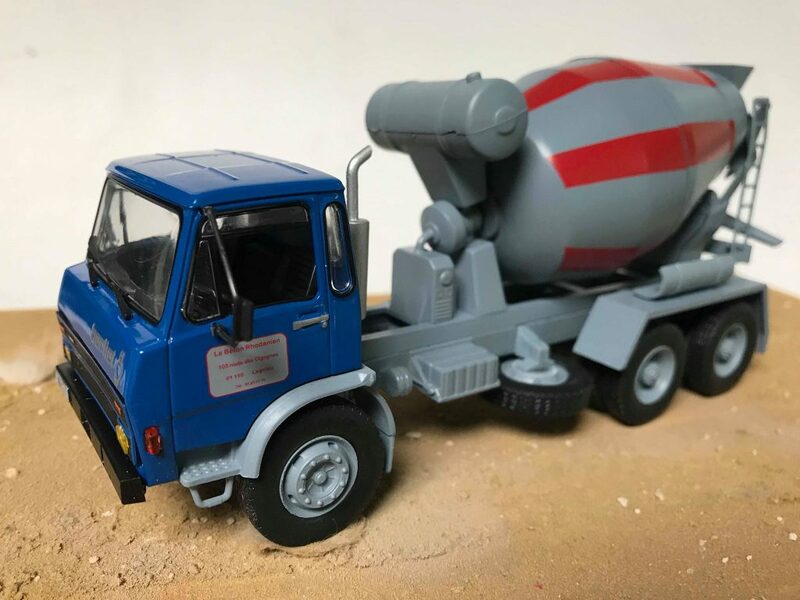 Hachette produced a series of Berliet trucks to 1:43 scale with at least 30 parts issued to date. 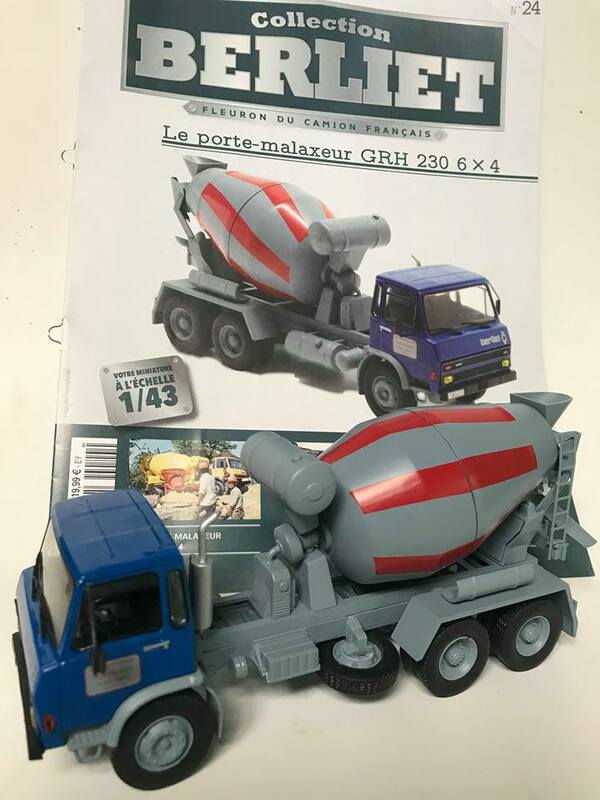 The model shown below was issued as #24 in the series in late 2018. This model was the first 6×4 lightweight Berliet with a tilting cab. It was a useful size, economical, and one of the last Berliet trucks made from 100% Berliet parts. The next series marketed by owners Renault V.I. will have a Berliet driveline, but will be fitted with a Saviem cab. 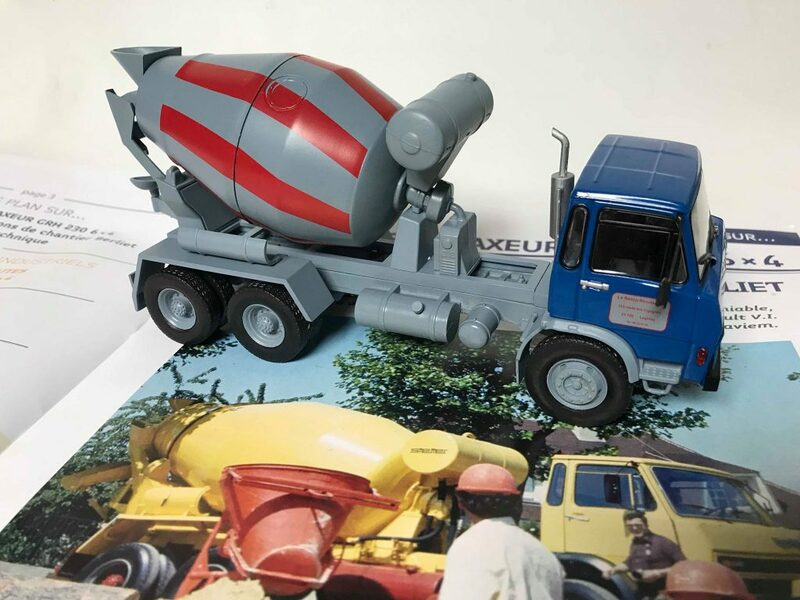 To counter the competition of Daf 2205 trucks in France and the Mercedes 2624B in Germany, Paul Berliet launched a truck targeted at the construction industry in 1976. This was the GRH 230 6×4. It was aimed at providing a truck that could cope with difficult sites. 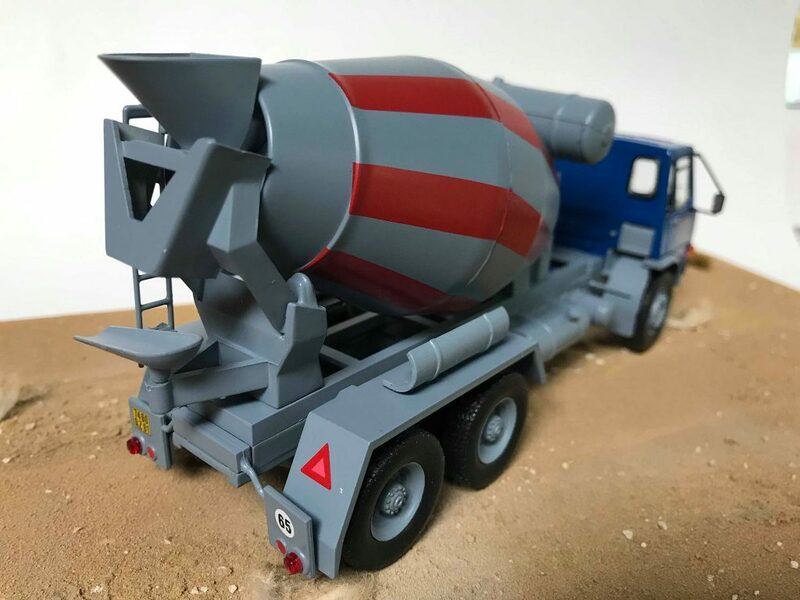 This mid-range truck was intended to operate on construction sites in urban or suburban areas. 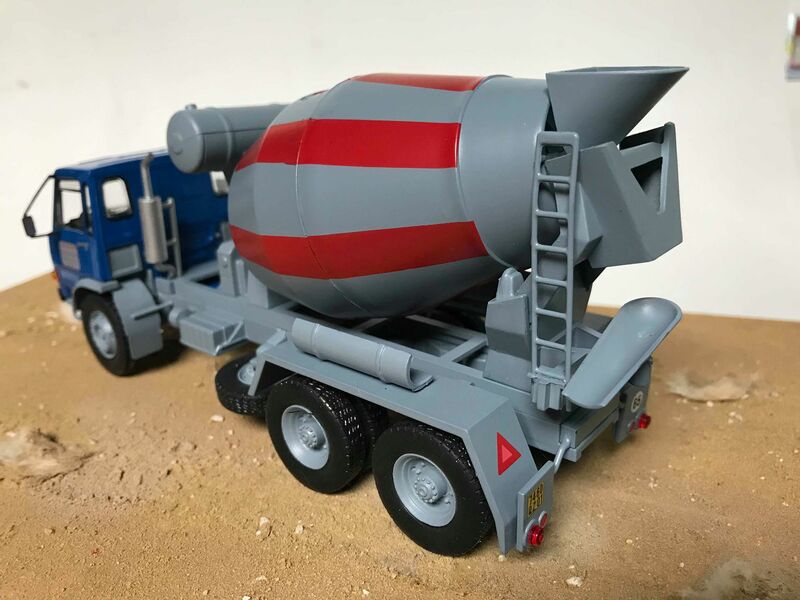 The chassis was equipped with various types of bodies: a light tipper; a tanker, or a concrete mixer of 6 to 7 cubic meters. In 1974 Michelin owners of Citröen and Berliet sold Berliet to the State so that it merged with State owned Renault‘s truck division. An injection of resources allowed Berliet to design a new engine which would last in Berliet derived vehicles for over twenty years. This was the engine, the MIDS 06.20.30 equipped with a turbocharger, that was fitted to the GRH 230 6×4 when it was launched at the Expomat Show in May 1976. The GRH 230 x4 was the first vehicle to benefit from this new high-performance, economical and lower emissions engine. The engine is coupled to a ZF S.6.90 gearbox plus a gearbox giving twelve “forward” and two “rear” gears to give a maximum road speed of 92 km/h. The two rear wheels feature double reduction (gearbox in the hubs), and they transmit only half of the final effort to the wheels. A total payload of up to 19 tons is possible. 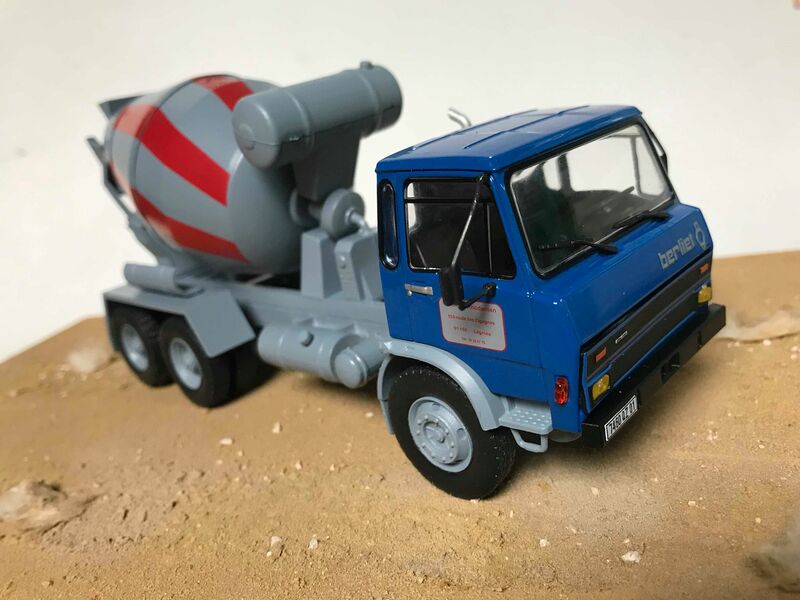 The new truck is equipped with the KB 2 200 Berliet- Citroën tilting cab designed by Louis Lucien Lepoix (Form Technic International in Neuilly) in 1968. Built from sheet metal, the cabin can be tilted 55%, enabling easy access to the engine. For day-to-day checks, the front panel has two stacked doors behind which you find all the tank fillers: hydraulic circuits, wiper motor, windshield wiper, heating, dipstick, etc. The model is a nice representation of the real thing in 1:43 scale. It has some cast-in under chassis details such as the prop-shaft, engine and air cleaner. The mixer unit is also a good representation of a drum of that period.